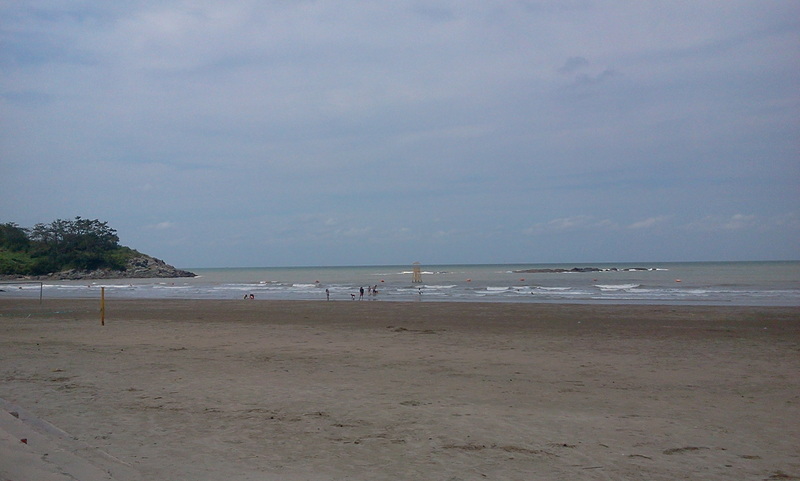 we took the bus to hongnong, ate breakfast in the seven eleven, walked past my school where i used to teach, then did a three hour hike over the mountain, past the nuclear power plant, to the beach at gamami. its always strange to come back to a place where one has lived and had intense experiences, after a long absence. walking around yeonggwang, where each street in this small, workaday city is still familiar, where most of the stores are unchanged, feels heavy with a kind of ambivalent nostalgia. i had been a little worried about finding a decent place to stay - i always lived here, before - meaning i had an apartment - and never have returned as a tourist until now. but just a few blocks east of the bus station we found a more or less quaint motel called 귀빈장모텔 (gwibinjang motel = roughly "honored guest place motel" or maybe more loosely "VIP motel") for 30000원 per room per night (25 bucks), which is entirely reasonable for korea. 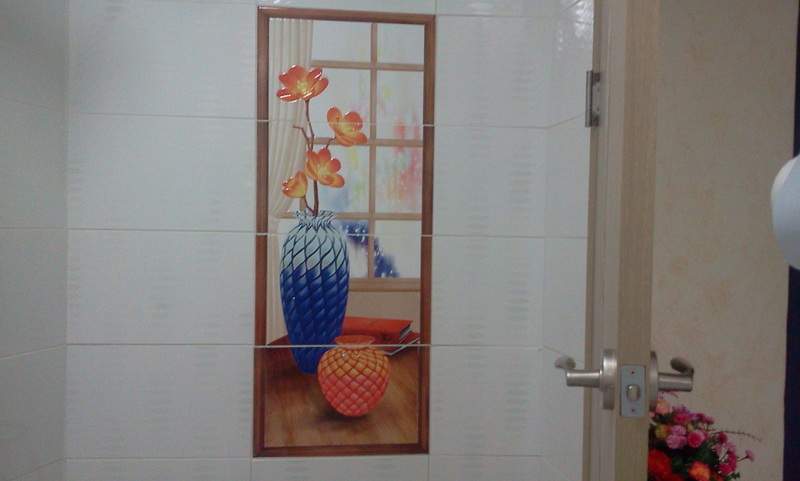 the tile work in my oddly shaped bathroom looks brand new, and had this kitchy but appealing artwork embedded (below). actually, the town feels marginally more prosperous than it did in 2010 when i lived here - there are fewer abandoned storefronts, and more cafes - always an indicator of gentrification in korea. but the town is utterly dead on a saturday night, just as i remember. i think everyone goes to gwangju to have fun. tomorrow i will show andrew and hollye hongnong and my favorite walks there - hopefully over the mountain to the beach and around to the waterfall south of town, then the odd "buddhist theme park" (my own made up designation for it) in beopseong. 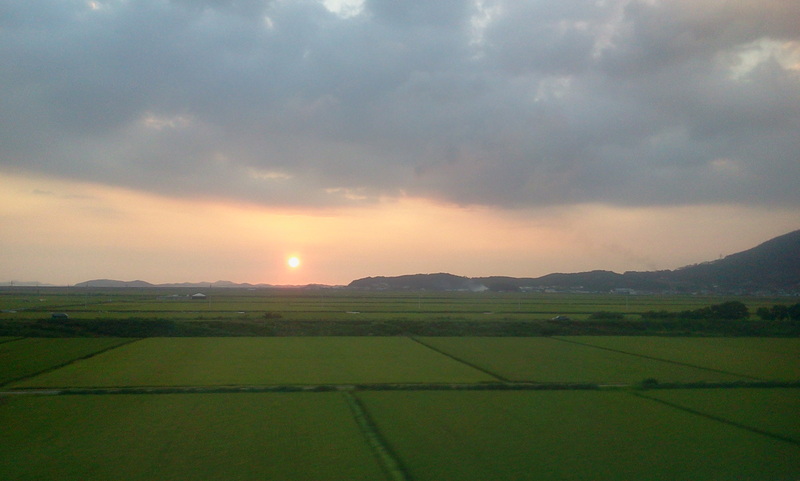 green korea of the summertime, grids of mature rice, china yanking down the sun beyond the yellow sea. on the way down south to glory county. 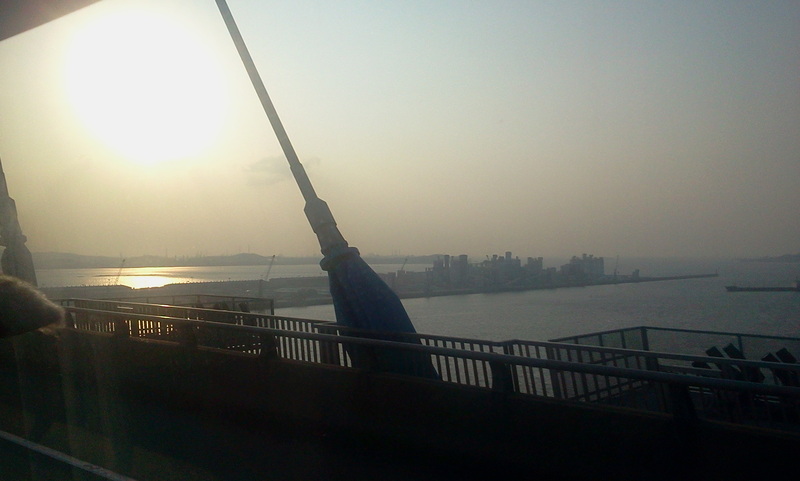 crossing the bridge at pyeongtaek port. Well, due to circumstances beyond my control, I was obligated to finish moving last night. My long, drawn-out transition from the Dongju apartment to the Urimbobo apartment is more-or-less complete - Andrew and Hollye can do the remainder on their own, this morning while I go off to work. It was kind of tiring, and my new apartment is a chaotic mess, and I'm leaving my old apartment much messier than my conscience would dictate. I don't like doing things half-assed. But sigh. I feel a bit overwhelmed. Andrew and Hollye have less than a week remaining here, and one trip I had promised to myself and to Andrew while he was visiting was a trip down to Hantucky. It's a pretty major undertaking, if only for the 4 hour bus ride, but I really wanted to do it. So despite my current less-than-optimal condition, we're going to try it this weekend. After I finish work today, we'll go off to the Goyang bus terminal, where research indicates there is a direct bus now (a new thing) that stops in Yeonggwang on its way to Mokpo. I guess we'll find some inexpensive hotel or yeogwan once there, spend the night, and explore around Glory County during the day tomorrow. Then I will hurtle back tomorrow evening so as to be able to make it to radiation Monday morning, while Andrew and Hollye can retain the option to stay down there and explore more over the next day or two following. It's Saturday, so no radiation today. That's good, I'm tired of it. Happy No Zappy day. i got here at my regular time, but the techs were ahead of schedule so as soon as i checked in at the automated computer station they called me back to the zap-o-room. i was still in a sweat from walking here and with the elevated pulse of the exertion. the session had a different quality to it - i felt more aware of the minor variations of the bed-tables orientation and position, its tiny stepwise movements through the fixed plane of the photon beam. the servo-motors of the raygun, ensconced behind its plastic torus, sounded like a mad scientists toy train, clackety clack always counterclockwise around my head. i wanted to cough, but i resisted. i visualized an old-timey steam train orbiting me and puffing out xray clouds, instead. after the session, the kind and personable tech whose name i havent learned and whose english is execrable, said cheerily, "see you monday have a good thisweek." "thisweek" means "weekend" - i make the same kind of semantic-field mistakes in korean. I guess the South Korean government, feeling jealous of all the fabulous anti-terror work being done in the US (see comic, below - it was sarcasm, OK? ), decided they could play that game, too. The South Korean government arrested some left-leaning parliamentarians from the UPP (members of the national legislature, i.e. Korean congresspeople!) on charges of plotting to destory infrastructure and collaborate with North Korea. This is way too reminiscent of the current president's father's dictatorial behaviors in the 1960's and 70's. Sigh. Here is an interesting editorial on the subject. Thanks to my friend Peter for pointing this out to me. I had a good visit with him yesterday, when he came out. Here's a comic I ran across, unrelatedly, but that seemed oddly relevant in its USA-centric way. My friend taught me this proverb yesterday, as we were discussing the habit of procrastination. [When] eaten first, the persimmons are sweet. One place I found this translated, it was given as equivalent to the old English proverb, "Please your eye and plague your heart." It seems to be about doing the easy stuff first. I don't actually like dried persimmons (or even fresh ones) all that much. So maybe this particular proverb doesn't work for me. I have been very tired lately. I think we all know why. I barely survived 2 hours at work today before I gave up and stumbled home. Helen asked me why I'm even coming; I said I need the structure and focus. It gives me a sense of purpose and is a bit of a distraction from this business of just being sick. heavy rain. badly upset stomach (maybe due to bibimguksu yesterday rather than radiation per se). took taxi - thought that would never happen? taxis are hard to get in the rain in ilsan. . . but here on time. Second, Change the earth to 유토피아 [yu-to-pi-a]. 유토피아 [yu-to-pi-a] is the world that work with self's ability and get the same payment. Think about it when all the people get the same payment their will be no poor and rich also there will no worry about tomorrow so all people can be happy. If that isn't a rough round-trip-translation (English-Korean-English) of Marx's "from each according to his ability, to each according to his need," I'm not sure what is. When I pointed out to Jaeheon that this was part of the communist program, he seemed deeply disconcerted. He said he had to think about it. I like students like Jaeheon a lot. 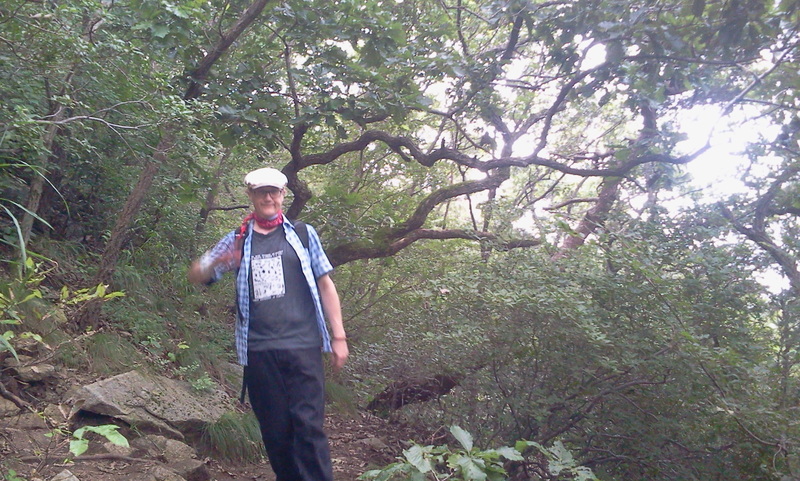 After my radiation treatment, Andrew, Hollye and I walked over the Jeongbal Hill to the subway entrance. I bid them farewell - they have decided to embark on a 2 or 3 day excursion to the northeast corner of South Korea, where they hope to go hiking in Seoraksan National Park. This is their thing - they are not city people, and for Andrew, especially, I often get the impression that his visiting me here in the suburbs of the world's fourth-largest metropolitan area is something of a psychological hardship for him. So I hope they have a good time. I'm a bit jealous, because all I get to do is attend radiation treatments each morning and correct essays all afternoon. 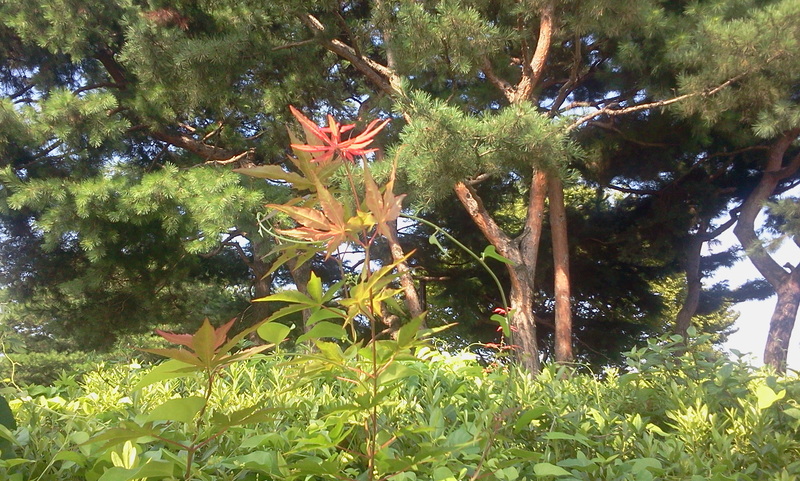 I've never visited the northeast - not Seoraksan, not Sokcho. I want to. Walking over the hill, I stopped and photographed some flowers at this one clearing area that I like. Just because. There's this weird bench thing made of rough-hewn fallen wood. There was a flower under it. After dropping them at the subway station and telling them "safe travels," I walked the rest of the way home. But I stopped at the Ediya Coffee location near my building (Ediya is one of Korea's many Starbucks knockoff chains), because lately I have become rather addicted to a grapefruit-flavored blended-ice thing that they make, which they call in brilliant pseudo-starbuckian konglishy marketingese a 자몽플랫치노 [jamong "flatccino"]. It's not likely that healthy, but possibly healthier than ice cream, which is another post-radiation treat I've been getting myself on occasion. last night i dreamed i was walking. just walking, along an infinite version of the sidewalk alongside the park that is the path to the hospital. it was like that amnesiac protagonist at the beginning of the wim wenders movie "paris, texas." just walking and walking as if his life depended on it. but not knowing why. an apt metaphor for life. and i walk, now, into treatment number 12. I woke up from my midday nap (which is now a thing, I guess) feeling like I'd been punched in the face. Punched twice, even - once for each side of my jaw. My teeth hurt. My jaw hurt. My mouth felt numb and swollen inside. I think they must have zapped new territory, this time, or in a different way. Argh. It's not really very pleasant. Work was a bit frustrating, too. I'm supposed to be part time, right? Maybe I'm supposed to be doing something like 20% of full-time. I am, on paper: I only teach class on Saturdays. But... they keep finding things for me to do - such that, in the last 6 days or so, I've worked closer to 50-75% of full-time: correcting things, making tests, etc. The hardest part is that these are all the tasks I like least about my job, regularly - it's like having to do all the annoying, tedious busywork surrounding teaching a class without the pleasure of actually getting to present the class. OK. Calming down. Taking breaths. I will be fine. I'm just venting a little bit. I'm pleased to have a job where I can feel useful and a boss that's flexible enough to let all this happen (although to be clear it's not pure generosity - there are financial adjustments that mean no sacrifices are being made). I will see this as further training in acquiring patience and equanimity. i slept a lot more than usual the past 24 hrs. a 2 hr nap yesterday at midday, plus more than 8 hrs over night. im supposing this is the alleged fatigue setting in. i felt some definite fatigue at work yesterday too, along with the really burning mouth, so i left early. but in the present moment i feel rested and energetic and in good, positive spirits. ive always liked that word in that usage: spirits. "spirit" just means breath, etymologically. so: "good, positive breathing." nevertheless, i dont really like other, related usages. "spirituality" is overused and has become a vague catch-all. i actually prefer the term "religiosity," even as applied to my own buddhist atheism. off to number 11. zzzap. I was looking at my bloghost's pageviews data. It's kind of interesting, in a "meta" way. Here's a screencapture from earlier today. The graph shows the last 120 days of my blog, with number of "pageviews" per day (people clicking through or navigating to my blog for whatever reason). The broad rise over most of July is what I've taken to calling my "cancer bump" - while I was in the hospital, a lot of people who don't regularly follow my blog began following it, and many people who do follow it, followed it more intensively or frequently. I was posting more, too, which may have increased the rate at which random strangers would have found it listed in google searches of various kinds. But I'm much more curious about the other notable feature of the graph. What in the world happened on August 19th? That's the most pageviews in a single day that I've ever gotten, by far. It's such an outlier. One of the assistants in the radiotherapy department did me a favor. Last week I gave him a USB flash drive, and he put a bunch of images on that drive of my various scans. I got the USB flash drive back this morning. Mostly, I was curious. Now, I have a lot of images - 2 full CT series (before and after), my pre-surgery MRI, my pre-surgery PET, and a "plan" image from the radiotherapy planning software. To be honest, my lack of training is quickly manifest. I have no idea what I'm looking at. I can't really even find my tumor in the "before" pictures. I have a guess, though. Here's image 49 from my June 28th CT. See the bulge on the left side of my tongue (right side of image because it's oriented "looking up the body")? I added a red circle to where I think the tumor is. I could be totally wrong - I didn't talk to the doctor directly about these images. But that bulge is slightly lighter in color and missing on the other side of my tongue. It matches to where I understood the tumor to be. Here is a picture from the pre-radiotherapy "plan." I think it's based on a pre-surgery scan, so you can see a red oblong encircled area on the left side of my tongue area, again, and a sort of dark spot which I wonder might be a false-color selection of the tumor area. You can see where they've highlighted with lines and enclosing shapes the areas of soft tissue where they will go cancer-cell hunting with their ray-gun. It's all very interesting. I wish I could be looking over their shoulders in the control booth when they drive the zap-o-matic. off to see the wizard. . .
Andrew, Hollye and I had an outing day in Seoul. First we took the subway to Insadong, where we wandered the crowded streets and then had lunch at my favorite vegetarian restaurant. After eating we were walking over to find a subway station, and we passed a restaurant with this sign in the window. Chinese: meh. But we love you. Then we headed over to 동묘 [dongmyo] is the site of a major flea market neighborhood. It just goes on and on. I've experienced many Korean fleamarkets, but only in rural areas - never in Seoul and never on this huge scale. I saw a box with an incomprehensible name (the English part, I mean). But it turns out this is an actual thing - moxibustion [the 뜸 of the Korean name] is a folk remedy where you burn mugwort against accupressure points on a patient's skin. Perhaps I should have invested in it? Andrew is huge believer in mugwort, and my mom is a believer in accupuncture. This would combine both, and might therefore be doubly effective. I decided to actively shop for one of my strange manias: I'm seeking a Korean manual typewriter. Not a made-in-Korea English (i.e. Latin) typewriter, but a manual typewriter made for typing Korean. This isn't as impossible as many people who don't know Korean might think - Korean is not like Chinese or Japanese, because the number of underlying symbols in the native Korean writing system (hangul) is quite small. I love manual typewriters: I have several (Latin ones) in my storage unit in Minnesota. This one guy we visited had many, many typewriters - mostly Latin, but several hangul. He was honest, however: he told me none of them worked. So I didn't buy one. Walking back to the subway, we saw a bicycle that looked Army-style. And a peaceful, desolate collection of greenery in an urban wasteland. Finally, we took the subway out to Bucheon, where we met my friend Peter. Peter is only a few weeks left from ending his teaching contract, and he intends to do some on-foot travel in Korea and then return to the US. We ate at a 짬뽕 [jjambbong] joint near his apartment and then Andrew, Hollye and I came back to Ilsan. 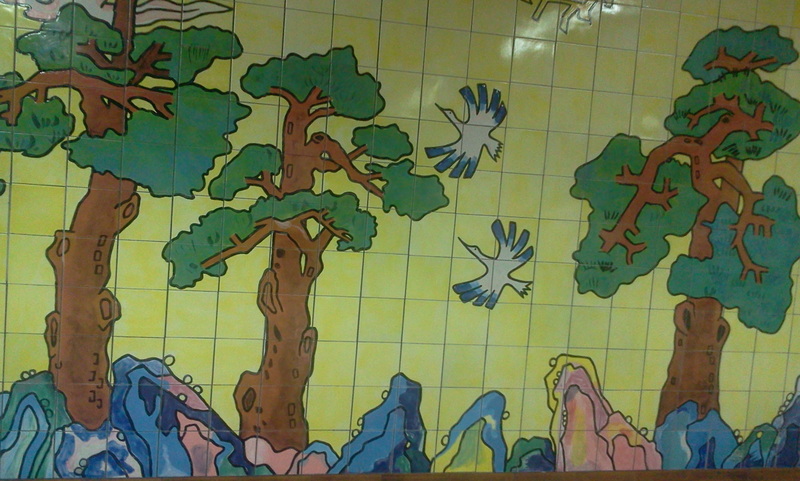 our subway train broke so they threw us off at 삼송역 [samsong station]. andrew noticed this mural on the wall, which he immediately described as "multicolored abstract alligators hunting birds under the trees." this caused me to need to take a picture of it. I found this in my Practical Dictionary of Korean-English Buddhist Terms. 온갖 사람들과 만나 무애자재 (無礙自在)하려고 하는 것이 변수행 (徧修行)이다. 철조망을 쳐놓고 수행하는 것만이 수승한 수행은 아닐 것이다. 몽매한 중생 제도를 위해 원효대사는 허리에 바가지를 차고 광대 흉내까지 내셨다. 저자거리에 나가 술꾼 아니면 푸줏간 주인과 잘도 어울리네. 오호라! 그가 손을 대자 늙은 고목 (枯木)에서 꽃이 피네. Marketplace practice: The true practice must be among the common people in their daily lives not in isolation in the deep mountains. With a begging bowl by his side to join the bunch of drunkards and butchers. Who said that only saints could perform miracles? A man touches the old dead tree, and Lo! the flowers are blooming on the old dead tree. It seems like half-poetry, half commentary. I'm tired. I need to nap. I was complaining about my hypochondria with respect to my radiation treatments to my brother, earlier this week (or maybe it was at the end of last week?). Something Andrew said struck me as the right perspective. I don't remember his exact phrasing, but he said, basically, that I need to remember not to make the radiation therapy the center of my life, and have other things going on, and it will be better that way. And so... that's what I've been doing. After the late dinner last night, I really worked a very full day, today. I corrected essays and proctored a 3 hour exam with lots of annoying technical issues, and felt like a generally productive member of society. And before that, I'd spent over an hour scrubbing various as-yet-unscrubbed surfaces in me new apartment. Not to mention the 2 hour nap before that, and some blogreading, and, well, before that, there was that pesky radiation treatment. In the broader picture, it ends up being just a sort of chore I have to do each weekday morning, nothing more. I feel very tired, but I feel pretty good. There's a throbbing pain in my mouth and my neck burns and I had nausea earlier but I don't care. I'm hungry and then I'm going to bed. I'll work tomorrow. almost one third done. . .
last night i dreamed i was in the army again. . but with my current age / body / state-of-health. and i went to camp edwards with some random soldiers only to find it empty and abandoned. . in its current state. there was some kind of alert due to north korea but no one was paying attention. we were living in field tents and everyone wad sitting around playing games on smartphones, including my brother. then suddenly we had to break camp. russians were making problems. my friend kristen showed up to explain that we had all been captured and would be transfered to a POW camp in siberia. i said what a bunch of bs, i was annoyed. so with my friend nate and with my brother we staged an escape that seemed to involve mostly walking through various korean malls. we ended up back at the abandoned camp edwards, where we were recaptured by the russians. i told them, "we are only prisoners if we believe we are prisoners." nobody listened. so i woke up. Yesterday was kind of busy. I met Dr Jo after my radiation, and it seemed like it went well. He seemed surprised that so far I'm still not having any trouble eating, and he was mostly reassuring with respect to my other symptoms, hypochondriac or otherwise. After that meeting, I walked home and ended up taking a long nap, and eating a lot. I had grapefruit, among other things, which I've been craving. That's not really anything new - I've been craving grapefruit pretty continuously for about 4 decades now - but grapefruit isn't always easy to run across in Korean supermarkets, so the craving matching up with availability was nice. Then I went to work, and ended up working the longest of any time since coming out of the hospital, because I spent 3 hours proctoring a pseudo-TOEFL test for some advanced students. Rather than pay big bucks for a "real" (or realish) TOEFL test, Ken and I decided to try to piece together our own mini-TOEFL, including essay writing (by making them type on the computer using the notorious MS notepad - to avoid giving the students access to spellcheck and that type of thing) and speaking (by making them record onto the computer using some mp3-recording freeware). It was the first time we've tried this, but I think it went well - well enough that I think we can make it a routine. And as I've said elsewhere, I've long ago given up battling South Korea's testing obsession and come to embrace it as a means to quantify outcomes and stepwise progress, not just for students and parents but for us as teachers as well. And then... after ending work at 10, we did 회식 [hweh-sik = business dinner]. We went to a "help-yourself" style meat-grilling place at La Festa (a local outdoor mall-type-thing). I intended to take some pictures, but I forgot. I ate a lot, though. I hope Andrew and Hollye felt comfortable - they got a chance to observe my workplace culture and dynamics. Curt remarked at one point to Andrew that I was quite changed, in his perception, from before my diagnosis and surgery. He said I had become a more positive person. I resist this stark division of my personality into before and after, as I don't think my fundamental outlook as been quite so transformed (despite some post-surgery epiphanies). What has changed is I have a much stronger commitment to projecting my positivity and gratitude to those around me. Anyway, it ended up being a late night, because of that. I went to sleep around 1 AM - almost like my old, regular work schedule. Except now I have to get up and go to radiation. for some reason i was moving too slowly this morning, despite waking up at my regular time, which is around 630. so i ended up feeling rushed and late getting to my 9 am appointment. so arrived less calm than usual. . stressed and frustrated. i started coughing as i was about to strap down. it was difficult to relax and stay still. . most difficult session so far, and i feel really desequilibriated and grumpy. . splitting headache, postnasal drip with painfully dry mouth at the same time. waiting to see dr jo (radiotherepy specialist) for thursday consult. Ta-Nehisi Coates is one of my favorite and most-visited bloggers. He writes over at The Atlantic. He's not the most polished - he often makes glaring or embarrassing typos in his entries (this seems to be one of the great challenges of frequent blogging), but he's a talented writer and sometimes he will drop the most profound and remarkable stuff in the most off-handed way imaginable. Lately, Mr Coates has been in France, because he's decided to learn French. Deciding to learn a language while long past one's presumed youth is an undertaking near-and-dear to my heart, as most people who know me know well. His most recent blogpost, as many recent ones, is about this experience. His last two paragraphs about his efforts to learn the language are really striking, to me - they are the sort of pep-talk I need when I feel the despair and frustration in my own efforts to learn Korean. It hoves so close to my own experience and insights. Before I came here everyone told me that the enemy was the French. It would be their rudeness, their retreat into English that would defeat me. But I am here now and it is clear that--as with attempting to learn anything--the only real enemy is me. My confidence comes and goes. I have no innate intelligence here--intelligence is overrated. What matters is toughness, a willingness to believe against what is apparent. Learning is invisible act. And what I see is disturbing. In class my brain scatters, just as it did when I was in second grade. I have to tell myself every five minutes to concentrate. The hardest thing about learning a language is that, at its core, it is black magic. No one can tell you when, where or how you will crossover--some people will even tell you that no such crossover exists. The only answer is to put one foot in front of the other, to keep walking, to understand that the way is up. The only answer is a resource which many of us have long ago discarded. C'est à dire, faith. This is cool - a guy made a cthulu using legos. I'm pretty tired. I probably will go to sleep soon. I know a lot of times this blog is pretty boring or banal or trivial, but that's what it's evolved to become - it's a way for me to let everyone I know who cares about me that "I'm OK."
i saw a man walking on the street yesterday with an iv cart. . carrying it rather than rolling it, due to some rough pavement. he looked like a pole vaulter, but he was smoking a cigarette. i dont think patients trudling their iv stands around outdoors is so common in the US, but it strikes me as more common here. . certainly, due to my own recent experience, i notice it more, especially near hospitals. one thing im glad for, during this radiation treatment, is that i dont have be constantly injected with stuff. Right across the street from my new (and very former) apartment building is a rather authentic Italian restaurant - the menu is in Italian and Korean with barely a handful of English on it anywhere. Back when I lived here before, the same location was some kind of mass-seafood joint that was open 24 hours, but during the intervening years between 2009 and now, the neighborhood has upgraded quite a few establishments. So I've been meaning to eat there. This evening, Andrew and Hollye and I went there and had one funghi and one rucola pizza, and a largish seafood salad thing. Here is a picture. The place has a slightly cheesy decor - which, if anything, makes it seem more Italian in some ways. On the bench seat behind us, there were some cushions and some teddybears. Andrew befriended one of the bears. Maybe. i caught an unexpected hint of approaching autumn just now, walking to the cancer center. it hasnt cooled off any, but the humidity seems less severe. i actually pulled a sheet over myself in a predawn moment in my un-air-conditioned apartment, this morning. here i go for number 6. When I was at 보문사 [bomun temple] on Sunday, in the shop beside the temple I found something I had always wondered if existed but had never actually seen before: an "on cloth" rendering of the 108 Buddhist affirmations that I translated (attempted to translate) in 2010~11. So I bought one - I seem to have developed a habit of collecting these cheap little cloth renderings of aphorisms and phrases and excerpts of sacred writings. I haven't analyzed it too closely, but I think they're exactly the same list. I still have no idea if these affirmations are uniquely Korean in origen or if they are translations of some older Chinese or Gandharan or Pali tradition. After yesterday morning's session at the hospital, I felt really tired. I napped for a short time, then met my friend Mr Kwon for lunch while Andrew and Hollye did their own touristic trip into Seoul. After lunch I went to work but there wasn't much for me to do there. Given I wasn't feeling very good, that was a good thing, so by about 6 pm I had come home. Andrew and Hollye came over and we watched a movie and I went to sleep. It felt like a useless day. I felt tired and achey and grumpy all day. I struggle with all these worries about the radiation: is that twinge of toothache a symptom? is that pain in my neck a symptom? how about the headache? Some no doubt are, others are just hypochondria. last night, i dreamed curt asked me to teach a bunch of debate classes. i was so happy. i was excited to be teaching all my much-missed students again. but i went to my first class and no students were there. i asked at the front desk and they didnt know where the students were. i wandered out into a large furniture store that was surprisingly sharing the same building with the hagwon, and found several students hiding under a table. i became extremely angry and began ranting at them about responsibility and keeping commitments and their wasting my time. when i woke up i asked myself, where is all this anger coming from? actually, i think its about frustration with how drawn out this whole treatment regime is. i go in for radiation 5 of 30 now. Yesterday Andrew, Hollye and I went to 보문사 [Bomun temple], which is on Seongmo Island which is off the coast of the larger Ganghwa Island which is basically straight west of Seoul at the mouth of Han River. We took a long, slow, local bus from Ilsan to Ganghwa County Seat, thence on a different bus (after some confusion as to where to catch it) to Oepo-ri on Ganghwa's west side, then a short ferry ride across the channel to Seongmo, and finally, after lunch of clam noodle soup and spicy herring salad, a last bus around Seongmo Island to the location of the temple. Waiting to board the ferry at Oepo-ri. Looking back at Oepo-ri from aboard the ferry. Many hungry seagulls freeloading off the "do not feed the birds"-disregarding Koreans. Looking back while walking up the steep driveway to the temple. Looking up at the temple area. Andrew and Hollye walking behind me. A large collection of statues regarding a stupa. I'm not really sure what this represents. Looking up the mountain at our ultimate destination. Looking down a big old tree. The entrance to the grotto temple. Small figurines hanging out on some mossy rocks. Going farther up the mountainside, there was a cast bronze statue of a many-headed, many-tailed dragon. Looking back down the mountainside. At the top of the many, many stairs we found the famous buddha relief carved in the cliff-side looking out to sea. Then we found a back-trail back down the mountainside. This sign says "danger." Looking out while waiting for the return ferry. Another ferry parking beside ours. Some views of boats upon our return to Oepo-ri. Here is a collection of temple-wall paintings thrown in here at the end of this blogpost. after visiting a temple and a famous buddha on the island we walked back down the hill along a forested trail. more about the temple and the buddha later. 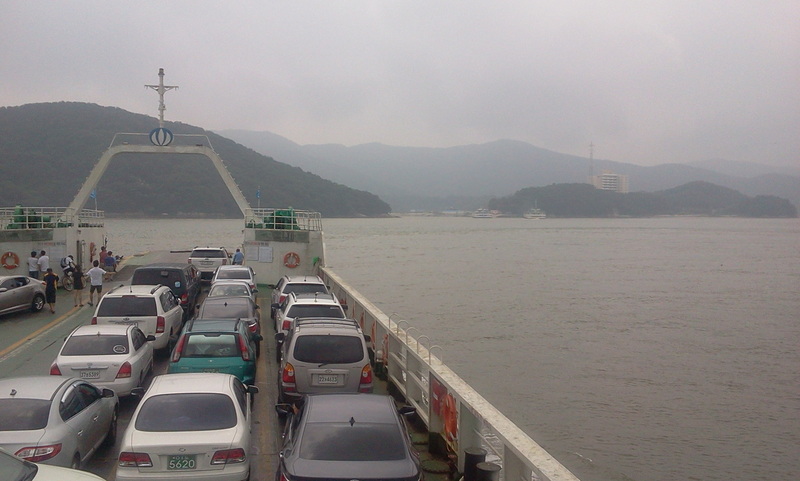 riding the short ferry to 석모도 [seongmo island].